Learn more about the healing power of love in my annual Valentine’s Day giveaway – my first book, The Chakra Diaries, free for download on Kindle through February 14th. The guided meditation, taken from The Chakra Diaries, takes you on a journey from the root chakra up to the crown chakra.. Listening to the guided meditation will result in greater balance of your chakra energies and well being of body, mind, emotions and spirit. 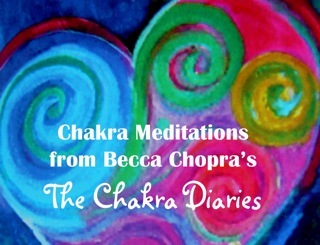 Listen to the audio and sign up for the FREE CHAKRA MEDITATIONS at http://www.thechakras.org/meditations.html. I hope you enjoy the inspiring quotes, stories, and interwoven chakra information and balancing meditations – and feel full of love for yourself and others. NOTE: The Chakra Meditations are always free on my website; TODAY, THE CHAKRA DIARIES, my book containing the meditations, is also free on Amazon Kindle. The Chakra Meditations are a short, but powerful, guided visualization, taking you from the root chakra to the crown. Thoughts and images are energy forms themselves, and have the power to move your energy into balance. Feel free to read these meditations for yourself, to a class, or to download my version accompanied by Aryeh David’s “Love’s Whispers” music.